Alex Constantine's Blacklist: Re "Alex Constantine Returns"
The Conservative Voice, a mine of ringing right-wing propaganda, is taking me to task for debunking the "Islamo-fascism" red herring. Paul Krugman is correct: "There isn’t actually any such thing as Islamo-fascism — it’s not an ideology; it’s a figment of the neocon imagination." Neocons parroting Bush, badly in need of a dictionary, promote the "islamo-fascism" line, eg. Raymond Ibrahim, editor of the Al Qaeda Reader, a scary omelet of texts written by Islamic extremists; it compares the words of Al Qaeda to Mein Kampf. Ibrahim performs this service at David Horowitz's FrontPage site. It's fairly well-known, of course, that Horowitz receives generous funding from Richard Mellon Scaife - a CIA propagandist since the early days of the cold war. (The intelligence connection runs in the family: "During World War II, while Richard and Cordelia's father, Alan Scaife, served in Europe in the OSS, the forerunner to the CIA, the Scaife family lived in Washington." Most of these CIA-subsidized propaganda machines are towing the "Islamo-Fascism" clunker. Krugman: " ... a bunch of lightly armed terrorists and a fourth-rate military power — which aren’t even allies — pose a greater danger than Hitler’s panzers or the Soviet nuclear arsenal ever did. ... "
Blogger Steve Benen comments, "The politics of fear might be more effective if it were grounded in reality." Why point the finger at the Middle East, when actual fascism is corporate and would probably not exist without the capitalistic impetus that flows internationally from the United States? Fascism is unbridled corporate control of government, military and propaganda functions - conceived in the west. Its propaganda only influences minds in the east, as it does everywhere else. It is an everyday feature of American life. It elevates thugs and criminals to positions of power. It is inherently conspiratorial and engages in acts of destruction to advance itself. It scapegoats "Islamo-fascists" - when American corporations in league with their corallaries in Germany, Japan, Italy, etc., make fascism possible and feed the geo-genocidal beast. The Middle East may have known Nazi collaborators, as did America itself, but make no mistake about it, the U.S. is the beating heart of it all. • IBM counted the Jews at Auschwitz - not shieks from Araby. • GM mechanized the Blitzkrieg - not desert camel drivers. • Standard Oil had a secret pact with the Reich - not fig sellers in Palestine. • Coca-Cola had Nazi contracts - not the oasis dweller. • BTW, what kind of sneakers do the Good Germans wear at Conservative Voice? What is a "limo liberal" compared to a "BMW conservative?" What music do they listen to? Nazis often describe themselves as "conservative," too. Fascism is all-American - all-capitalist, all-corporate, all-degenerative. The yahoos who prattle about "Islamo-fascism" echo G.W. Bush, who hails from a family with reasonably well-known Nazi financial connections. The great brainwashed, willfully ignorant finger-pointers are turned the wrong direction. 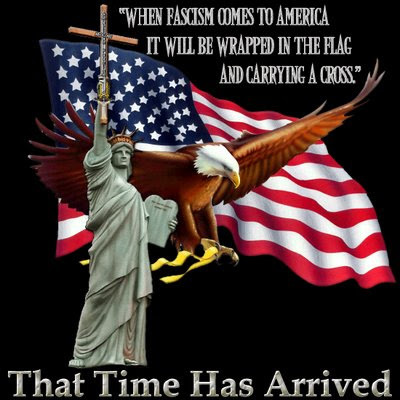 America's ruling elite are the fascists, and they are bringing the country to its knees.
" ... Liberals have blindly hated president Bush so much that they cross the line into anti-Americanism while dressing it up as criticism of America or criticism of President Bush. They even have the nerve to compare President Bush to Adolf Hitler and president Bush's America to Adolf Hitler's Germany. ... "
Liberals (anyone who finds "conservative principles" to be morally nauseating) have the "nerve" because we have the goods on Bush. Some 80 percent of those polled have gleaned insights in the past eight years into the fascist agenda that Solomon celebrates in his column at Conservative Voice, a cesspool of right-wing delusions dressed up as a liberty bell for the weak-minded, pathologically inane yahoos of Murdoch Nation. Columbus: Hero, or Slave Trader? Opponents of Required Vaccinations Rally in N.J.
Covert War Against Tim Buckley?